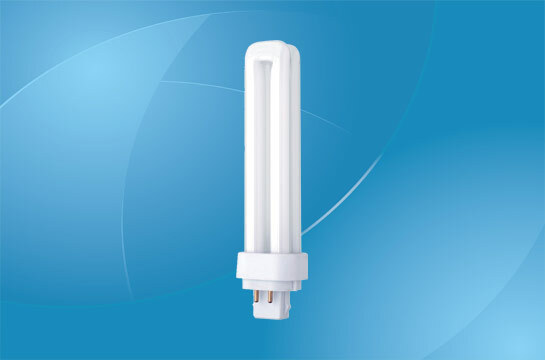 When it comes to compact fluorescent lamps, it must be mentioned that there are several different types of them: triple biax lamps, spiral lamps, F lamps, circular lamps and PLC compact fluorescent lamps (also referred to as “Double Biax” or simply “PL Clusters”). Here you will find out more about PLC compact fluorescent lamps: their typical features, benefits as well as the most common applications. 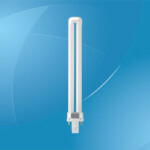 The PLC lamps are able to provide the same amount of light as the twin tube CFL lamps of an equivalent wattage, the sole difference is that they are half as big as the twin-tube CFLs. For this reason, the PLC compact fluorescent bulbs fit perfectly in small lamps and other similar applications. Also, it must be mentioned that there are two main types of lamps: the 4 pin PLC light bulbs and the 2 pin PLC light bulbs. The finish of the lamp should be taken into consideration mainly for aesthetical purposes: the lamps can have a cool white finish, a warm white finish or a special daylight finish. In a nutshell, these are low-pressure discharge lamps that work on a very easy principle: upon ignition, the radiation that results from the mercury inside the glass tube is converted into a bright light. The color of the light can slightly vary based on the phosphors (harmless substances) that are used. When the lamp is turned on, the mercury starts to evaporate when the temperature inside the bulb starts to rise – slowly but surely, the vapor that results from the mercury starts to fill the whole lamp. The control gear plays a pivotal role here, as it ensures the proper luminous flux is provided – in the case of PLC compact fluorescent bulbs, the control gear is located in the lamp casing. The phosphors do not pose any health risk, even in case of lamp breakage, this is what makes these lamps very safe to use in the long run. PLClamps are very popular lighting sources and they are designed for indoor illumination purposes only, this is why they are commonly used as desk lamps, emergency luminaries, fixture lamps and other similar applications. They are efficient, reliable, durable in the long run and very energy-efficient. On the other hand, these lamps are also perfect for round, square or rectangular downlights as well as wall lights in hotels or office buildings. One of the most important features is that both inductance components and electronic components are available on the market, and the average working voltage is between 110v and 220v. The color temperature varies based on the type of lamp and phosphors that are used, and it ranges between 2,700 and 10,000K. 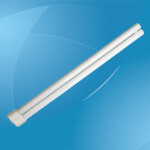 The long rated life, the high energy-saving properties along with the very high luminous efficacy are three other essential features that should be taken into consideration when purchasing a PLC compact fluorescent lamp. Last, but not least, some manufacturers use a special tri-phosphor component in order to produce this type of lamp.